Luton full back Jack Stacey doesn’t think that nerves are playing a part in Town’s stumble towards the finishing line this season. 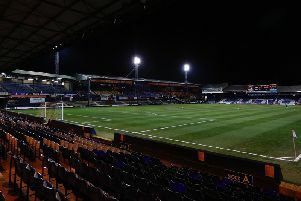 The Hatters lost top spot for the first time since November on Saturday, beaten 2-1 at home by Accrington Stanley, meaning they have won just once in five games, with three draws, taking six points from a possible 15. However, Stacey doesn’t believe that any anxiety is creeping into the squad with promotion in their grasp, as he said: “I wouldn’t say nerves no. "I just think we’re going through a little run at the moment where maybe a few things aren’t coming off like they did at the beginning of the season and we’re just looking to get back to winning games. “We had a talk in there, I think Accrington had two shots, or two good opportunities at Stechy’s (Marek Stech) goal and they’ve taken both opportunities, so fair play to them for being ruthless. "We’re obviously gutted, but we still believe that we can go on, 10 games left and we’re looking forward to it. “We looked around in the dressing room and the gaffer said he couldn’t fault us for the way we played. I think we were the better team throughout, just obviously the two goals were sickening really. “A few others sides dropped points as they’re going to, so all we can do is focus on ourselves. "We still believe we’ve got the best squad in this league, so lets go and play the last 10 games." Meanwhile, like the rest of the Hatters' players, Stacey will use the experience of witness Accrington's players celebrating after the final whistle as motivation to ensure Town go up this term. He added: “That’s exactly what we said in the changing room. Last year they could hear Blackpool celebrating in the changing room and could do nothing about it. "Now, you can hear them celebrating and we’ve still got 10 games to go for us to turn that around."